One genre I want to read more of is YA mystery. There are so many good books coming out this year that makes me want to give it more of a try. This is one that I received through Edelweiss. Years ago, Mia and Brynn were best friends with Summer, all of them obsessed with a book called Lovelorn. They were so obsessed that they wrote their own fanfiction. Then, one day, Summer was brutally murdered. Everyone assumed it was Mia and Brynn who did it out of their obsession. However, it wasn’t them. Five years later, they’re going to find out what actually happened. When I read it, I immediately thought of the Slender Man stabbing. Those girls who stabbed their friend (who survived) to impress Slender Man. This felt like it was partially pulled from the headlines, which I really loved. It was nice to read something I could connect to another crime while it wasn’t an exact copy. The characters in this were really good too. Mia is quiet and has a stutter. She doesn’t stand up for herself much. Brynn has been in and out of rehab for years, a lesbian who was outed in school. They had their issues from the crime and the resulting witch hunt against them, something I liked seeing. And it didn’t stop with their issues, but the issues that affected their families. It was refreshing to see that in YA. The side characters were also interesting. Wade, Brynn’s cousin, was hilarious. 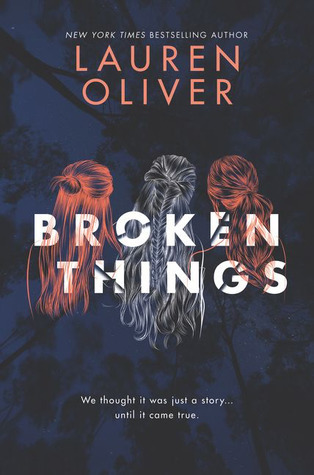 Owen, Mia’s long-time crush and Summer’s boyfriend, was interesting, too, because he had the exact opposite despite being assumed he was her killer. Abby, Mia’s friend, was great because I loved seeing the rep of an overweight girl who loved makeup and fashion and was a YouTube star, along with questioning her sexuality. At the heart of this book, though, was Mia, Brynn, and Summer. Three broken things. The plot surrounding them was absolutely enthralling. I didn’t want to put it down because it was great to read about a friendship that wasn’t healthy. And it wasn’t shied away from at all, because I think that unhealthy friendships aren’t talked about enough. It’s an anecdote. That crazy friend you once had. And it’s a joke. Having been in these, it’s not funny. And it was so nice to really see it like this. However, I wasn’t crazy about the culprit. I kind of saw it coming, but I also didn’t. It took me off-guard like “wait… really?” Not a bad thing, just that I was hoping for something different and exciting. There were two romances in the book that weren’t horrible, but I also wish they had more development to them. One was more developed than the other and the one that wasn’t developed (and was the queer one) left me wishing for something more. I liked that it was realistic that the straight friend assumed they were just close friends, but I also wish that more had been confirmed since it deserved better. Overall, I really enjoyed the book. I was absolutely captivated by it, but I had little niggling things that could have made it a 4.5 or 5 star read instead of the 4 I gave it. Do you have a favorite YA mystery? What is it? I’m so excited for this book!! So glad to hear you enjoyed it! Thank you! ❤️ I hope that you enjoy it when you get to it! !